Leave it to Mike Isley to have incorporated a blue and white Menorah and Star of David in his holiday décor this season. At an early age, Mike was introduced to the Jewish culture, and quickly developed a great appreciation and respect for his Jewish brethren. Mike is a tried and true Texan. Having grown up in Amarillo, he attended West Texas A&M in Canyon. He always loved studying Bible, so when his good friends had the opportunity to study under Biblical scholar Dr. Roy Blizzard at the University of Texas, Mike was all ears. Dr. Blizzard spent much of his time in Israel in study and research, and directed numerous historical and archaeological study seminars there, one of which Mike’s friends attended. Hearing about their extraordinary experiences at an archaeological dig in Israel, Mike longed to visit the holy land. His first trip to Israel was during his college years. He later returned with a church group. This was back in the mid-1980s, and rather than fly into Ben Gurion International Airport, Mike recalls entering into Israel from Jordan, just as the ancient Israelites had done after forty long years in the desert. Mike fell in love with the land the moment he got there. He felt comfortable, and knew he was home. “From that moment on, I knew I was a Zionist,” he recalls. is one of my great heroes.” In July, Mike and Sondra spent a lot of time together in Washington DC brainstorming about how to help Israel. 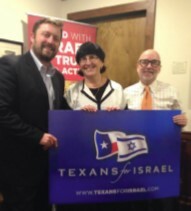 The result was the fabulously successful “Taste of Shabbat” dinner, which Mike hosted this past November in Amarillo. About 130 people were in attendance and applauded thunderously as Sondra Baras, Margy Pezdirtz, and Kim Troup presented the founders of God’s Learning Channel, Al and Tommie Copper, with an award for their pioneering work for Israel. Mike credits GLC for so much of his own understanding and enthusiasm for Israel. Sondra has recently begun to teach the weekly Torah portion on GLC and was able to share thoughts about the Torah portion at the Shabbat Dinner as well. Since his first trip to Israel, Mike has been back nearly twenty times. While there, he splits his time between travel, spending time in Jerusalem, and Judea and Samaria. He is always looking to lend a helping hand. During his last trip Mike traveled with a chiropractor friend who gave free treatment to Israeli soldiers post-Operation Protective Edge. In Samaria he visited friends Tommy and Sherrie Waller of HaYovel, helping harvest grapes in the fields of Har Bracha.